This company’s resonator technology could very well become a key factor in enabling filters for 5G applications. The smartphones that permeate today’s world wouldn’t be possible without the RF filters found inside of them. And with 5G rapidly approaching, the need for high-frequency filter solutions is only going to intensify. One company that’s making a significant impact within the mobile-communications filter space is Resonant. The firm recently unveiled its new technology, which it believes holds great promise for future RF filters for 5G mobile devices. Before getting into the announcement, it’s worthwhile to first examine Resonant along with the filter market itself. Founded in May 2012, the firm now has over 60 employees with more than 60 designs under contract from 10 customers. The company’s business model is based on licensing rather than manufacturing. Of course, filters play a critical role in smartphone RFFE architectures—a role that will only be magnified by 5G requirements. 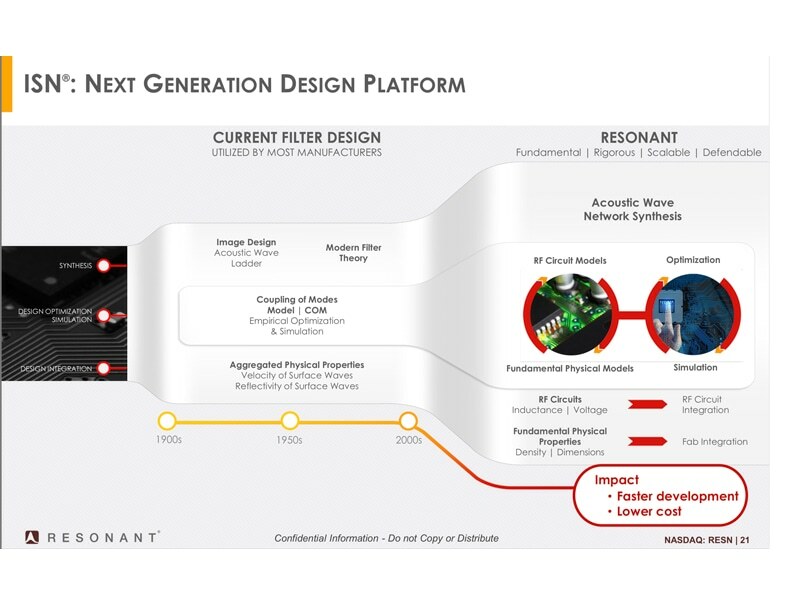 Resonant has developed a technology, known as infinite synthesized networks (ISN), that’s made a significant impact in the RF filter realm (see figure). “We have developed a software platform called ISN, which we use to design complex filters for our customers that go into a mobile handset,” says Eddy. “ISN represents a very different approach compared to the way filters are designed in most cases. What ISN does is bring fundamentals to the design space of a filter. ISN technology also allows the company to investigate potential new solutions. Eddy adds, “The other part of ISN is that it enables us to start to look at different kinds of structures so that we can come up with structures that are much more applicable to new applications. We’ve been using ISN to look for new structures that will be applicable to 5G filters. Resonant speaks very highly of XBAR, boasting that it’s a “revolutionary acoustic resonator.” So, what’s special about it? Eddy says, “With XBAR, we now have a resonating structure that has the strongest acoustic-wave coupling of any resonating structure on the market right now. It offers three to four times more bandwidth than the 4G resonators used in the mobile space right now. This technology gives us the ability to design filters for very wide radio channels—the bandwidths we’re talking about are in the hundreds of megahertz. We’re also looking at going up to 1 GHz. Resonant’s ISN technology, based on circuit models and physical models, is used to develop filters for mobile handsets.